APEC officials shared views and experience in negotiating, concluding and implementing regional trade agreements (RTAs) and free trade agreements (FTAs) at a dialogue in Ho Chi Minh City on August 27. The APEC Senior Officials Meeting (SOM) Dialogue on RTAs/FTAs brought together APEC senior officials, official observers, speakers, and representatives from the businesses community. According to statistics released by the APEC Secretariat, as of December 2016, more than 150 RTAs/FTAs signed by at least one APEC member economy has gone into effect with nearly 60 intra-APEC agreements. Thanks to their impacts, intra-APEC trade has increased by 174 percent, from US$ 2.3 trillion to US$ 6.3 trillion during the 2000 – 2016 period. 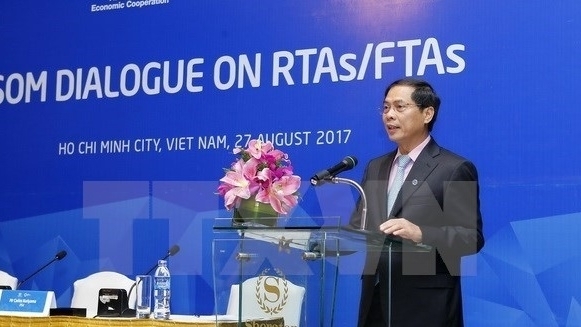 In his opening remarks, Deputy Minister of Foreign Affairs of Vietnam Bui Thanh Son, who is also APEC 2017 SOM Chair, said over half of the world’s FTAs originates from the Asia-Pacific region. APEC is naturally the best platform to discuss FTAs/RTAs, he said, noting that for the past 30 years, RTAs/FTAs in the APEC region have flourished in number, scope of work and sophistication. Increasingly sophisticated, next-generation regional FTAs, addressing next-generation trade and investment, behind-the-border and non-tariff measures issues are being developed with major implications, he said. 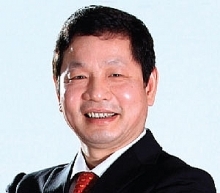 Regional economic integration will continue to be one of APEC’s core cooperation pillars, including fostering RTAs/FTAs and with a view to the realisation of the FTAA, Deputy Minister of Foreign Affairs of Vietnam Bui Thanh Son Son said. In the context of positive signs of regional and global economic recovery, making the most of benefits from RTAs/FTAs is important to create new dynamism for economic growth, as well as trade and investment in the region, he noted. Son highlighted the enormous static and dynamic benefits of FTAs on economic growth, market access, FDI attraction or domestic institutional reforms. However, he said, in the current regional and global economic context and under the impacts of the fourth industrial revolution, the question is how to make the most of the socio-economic benefits that FTAs bring about, concurrently with mitigating adverse impacts arising from adjustment costs, and increasing income disparity. Additionally, given the economical, political and developmental diversities in the APEC, sharing of information, experiences and engaging in negotiations and conclusion of RTAs/FTAs is useful, practical and necessary for mutual economic development, social stability and shared prosperity for the whole of the Asia - Pacific region, he said. The delegates mulled over the engagement of stakeholders in RTA/FTAs, lessons learnt from RTAs/FTAs and impact assessments, and continued work for the APEC, including the work programme to implement the Lima Declaration on the FTAAP. The APEC is in the process of realising the Bogor Goals of trade and investment liberalization and facilitation by 2020 as well as shaping an APEC vision for the realisation of a FTAAP.